Rangers patrol the forest daily, removing snares in continued efforts to protect the critically endangered mountain gorillas. 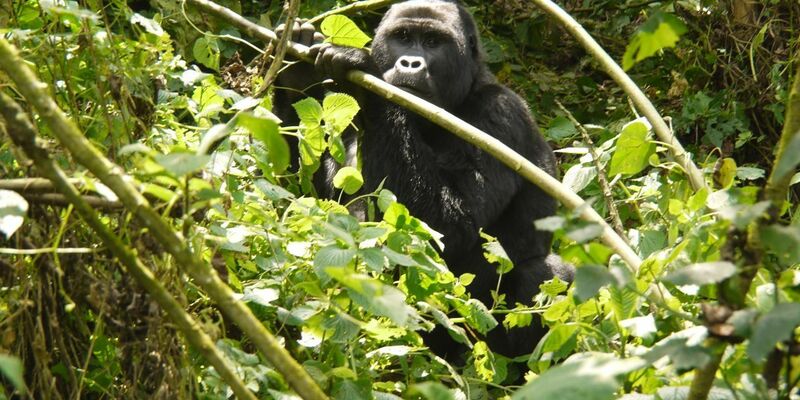 It was on a routine patrol in 2012 that tracker John Ndayambaje saw two juvenile gorillas: a male named Dukore and a female named Rwema, rapidly destroy two traps. Snares are a common occurrence in the national park, home of the mountain gorillas, and although they are intended to catch antelope and smaller species, they can also ensnare the great apes. Adult gorillas can generally free themselves, but a younger animal may not be so lucky, as seen in the case of an infant named Ngwino who died from injuries after being caught in such a snare – she had dislocated her shoulder trying to escape and developed gangrene from open wounds where the rope cut into her leg. The gorillas observed on this occasion are a subspecies of the eastern gorilla: Gorilla beringei beringei. There are only an estimated 680 mountain gorillas left in the wild, in two separate small populations, so every life is precious. This entry was posted in gorilla and tagged poachers, snare, tap by Exposing the Big Game. Bookmark the permalink.